Urban sprawl is shaped by various geographical, ecological and social factors under the influence of land market forces. When modeling this process, geographers and economists tend to prioritize factors most relevant to their own domain. Still, there are very few structured systematic comparisons exploring how the extent of process representation affects the models’ ability to generate extent and pattern of change. This chapter aims to explore the question of how the degree of representation of land market processes affects simulated spatial outcomes. We identify four distinct elements of land markets: resource constraints, competitive bidding, strategic behavior, and endogenous supply decisions. 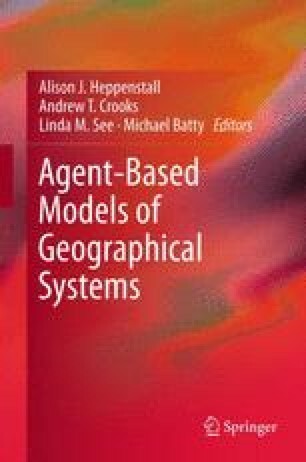 Many land-use-change models include one or more of these elements; thus, the progression that we designed should facilitate analysis of our results in relation to a broad range of existing land-use-change models, from purely geographic to purely economic and from reduced form to highly structural models. The description of the new agent-based model, in which each of the four levels of market representation can be gradually activated, is presented. The behavior of suppliers and acquirers of land, and the agents’ interactions at land exchange are discussed in the presence of each of the four land-market mechanisms. Funding from NWO-ALW(LOICZ-NL) Project No. 014.27.012 and the U.S. National Science Grants No. 041406, 813799, and 0119804 is gratefully acknowledged.